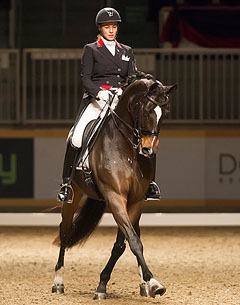 Dressage rocked the house at the 2014 Toronto Royal Horse Show on 13 November with Jacqueline Brooks winning the Grand Prix Freestyle portion of the $20,000 Royal Invitational Dressage Cup. Karen Pavicic’s consistency across the two days of competition earned Don Daiquiri the overall title. Only four Canadian riders contested this national Grand Prix tour at The Royal. Brooks (Cedar Valley, ON) and D Niro laid down the freestyle of the evening with 73.750%. Brooks’ custom music included personalized segments from the Flower Duet from Delibes’ Lakme; Les Miserables and Nessun Dorma; and suited her powerful, expressive gray, D Niro, to a T.
Surrey, BC, native Karen Pavicic finished the Freestyle in second tonight, but combined with her win yesterday, meant she would be the overall Champion with the accurate and methodical Don Daiquiri. Their test this evening was nothing if not ambitious, from halt right into one-tempis into a canter pirouette; rocking away to crowd-pleasing One Republic, American Authors and Avicii. Equally impressed were the judges, awarding Pavicic and Don Daiquiri 73.167% for their Freestyle. Jill Irving of Moncton, NB, rode Pop Art conservatively for those used to seeing “Poppy” in the winner’s circle at The Royal, but put in a perfectly respectable test for a freestyle score of 70.458%. Irving is no stranger to winning at The Royal however, having multiple hunter championships under her belt before switching to dressage. Britney Fraser (New Glasgow, NS), rode Countess to third with a score of 69.625%.